It’s Baselworld week, finally, we can discover all the new models coming out in the next year from all the major watch brands. 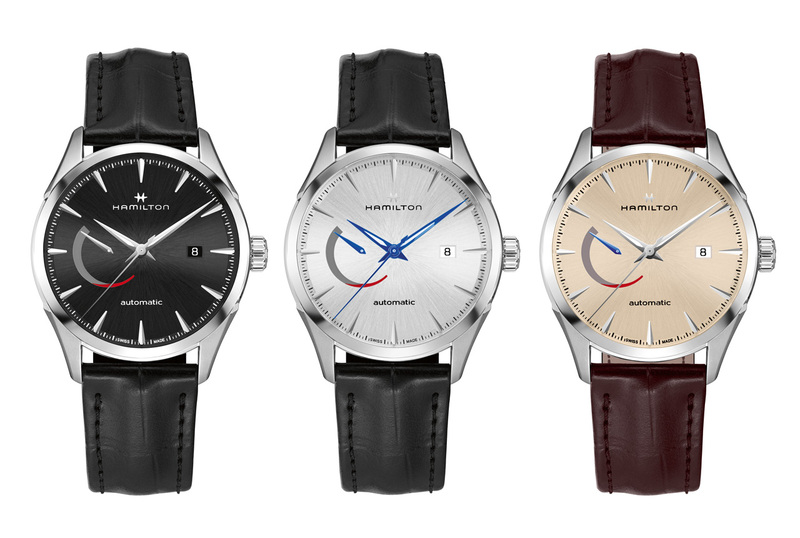 We will start with Hamilton that has a very interesting lineup this year, including a few completely new models, a new movement, new colours for existing models and a re-edition of a very cool retro chronograph from 1968. It is also the first year when Hamilton is using 3D printed dials. Right off the bat, let’s start with a model that made a lot of waves even before Baselworld, the Intra-Matic 68. 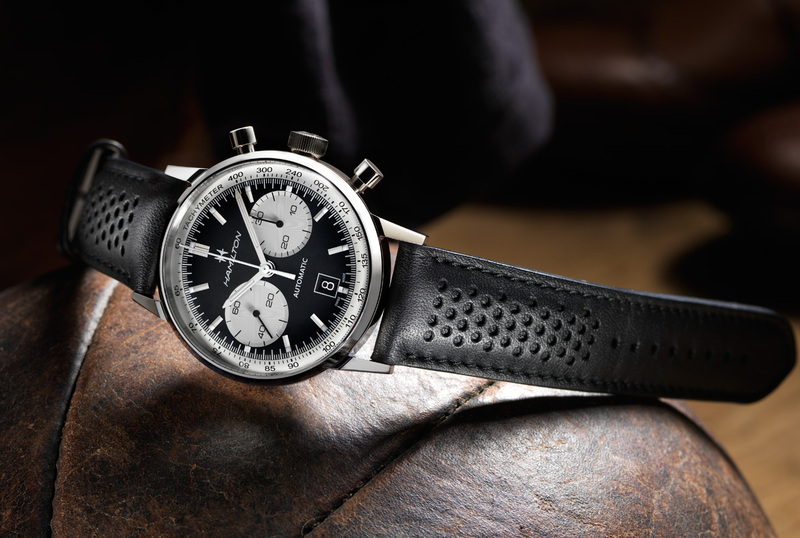 With this one, Hamilton is revisiting one of their success stories from 1968, the Chronograph B remembered for its cool reverse panda dial — the panda dial belonged to Chronograph A from the same year. As with other such re-editions, it has many of its features updated to today’s tastes, such as the 42 mm diameter, which is larger than the original watch, and a new engine, the automatic H-31 movement offering 60 hours of power reserve. Other than these, everything else radiates vibes from the good-old-days: the old Hamilton logo, the domed dial, the curved hands, the perforated black calf leather strap, this is a vintage watch with a new heart. This is beauty is limited to 1,968 pieces and it will retail for CHF 2,150. Reading up the specs of this watch left my mouth watering, it has a diameter of 40 mm, it is water resistant to 100 m and it is powered by the H-10 calibre that offers 80-hours of power reserve. 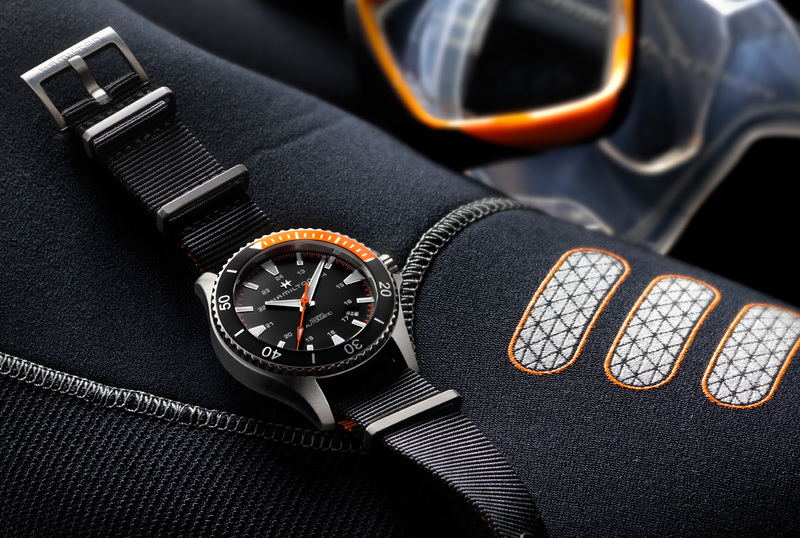 Finally, a diver watch that would look good on my small wrist! The black dial, the lume-filled indexes and hands, the rotating bezel with orange detail, and a very reasonable MSRP of CHF 695, they make it one of the top watches on my wish list. 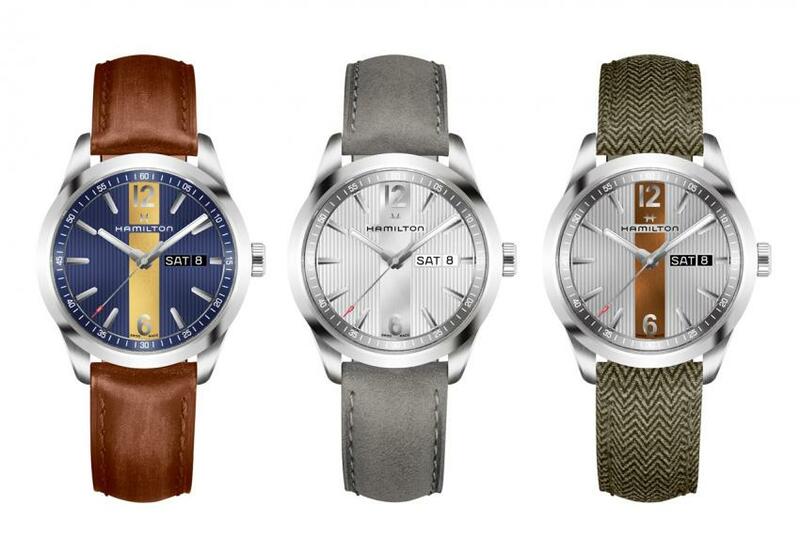 This year the Khaki X-Wind family has a new member that comes with a day date complication. It’s just as big as its chronograph relatives, 45 mm, and it features the three crowns that can operate the different calculations of the watch. It is powered bu the H-30 automatic movement that comes with 80-hours of power reserve. 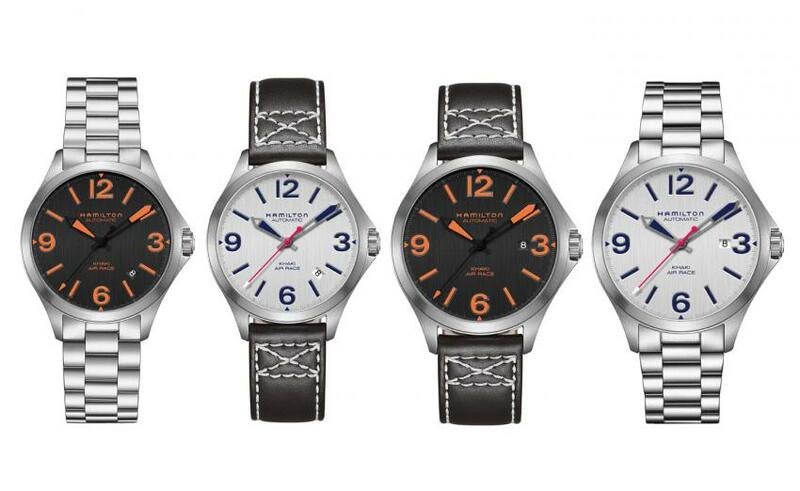 There will be several steel versions, as well as a black PVD coated model, and a choice of steel bracelet or leather strap. It will start at CHF 1,074. 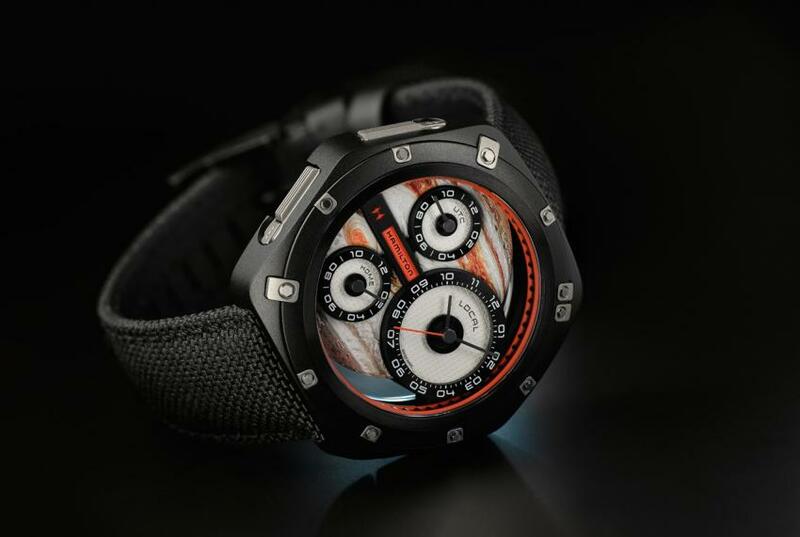 Here is a very interesting watch that deserves more than just a few lines. We all know about the close relationship Hamilton has with Hollywood, there are countless blockbusters and Oscar-nominated movies featuring Hamilton watches. Hollywood left its mark on the history of the brand, and the ODC X-03 is the latest model celebrating this long-lasting relationship. It is the third model in a trilogy of watches that have their roots in Stanley Kubrick’s 2001: A Space Odyssey. Launched in 2006 and 2009 respectively, the X-01 and X-02 were inspired by what is widely regarded as one of the greatest and most influential movies of all time, featuring also a quirky and futuristic approach to watch design. 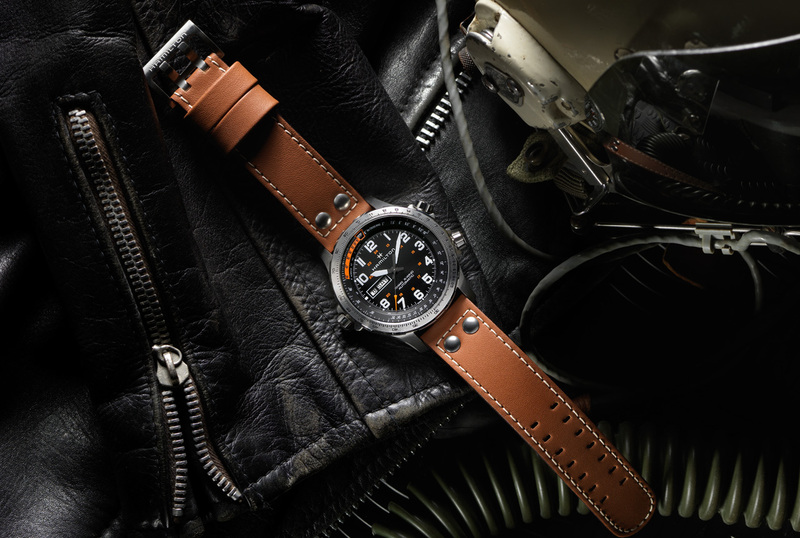 The ODC X-03 is the work of Nathan Crowley, the Oscar-nominated production designer of Interstellar, who also designed a one-of-a-kind Hamilton Khaki worn by Murph in the movie. The ODC X-03 is designed for space travel, with a 49 mm by 52 mm hexagonal titanium case, you will probably need a spacesuit to wear this beast. It also comes with three different movements, two ETA 901.001 quartz and an automatic ETA 2671, showing three different time zones. The three subdials are orbiting a 3D printed representation of the Jupiter, a tribute to Kubrick’s movie, while the back is engraved with facts about the giant planet. The crowns are seamlessly integrated into the case. It will be limited to 999 pieces, and it will retail for CHF 3,500. With the Jazzmaster Power Reserve, Hamilton is introducing a new automatic calibre, the H-13 with 80-hours of power reserve. 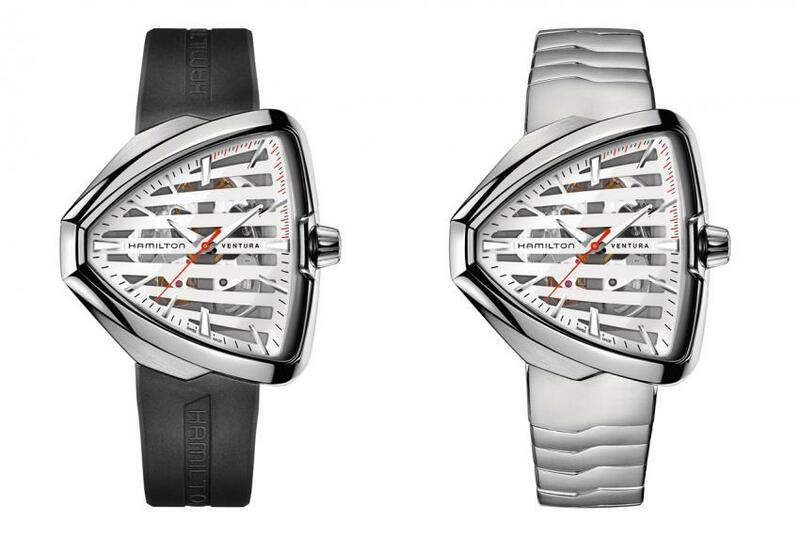 The elegant dial is dominated by a large power reserve indicator. The retail price will start at CHF 1195. The Ventura is known as the Elvis Presley watch, another model with roots in Hollywood, the King wearing it in the 1961 Blue Hawaii. This year, Hamilton unveiled three reinterpretations, the Classic line with gold PVD, another Classic with blue denim printed dial, and a Skeleton. 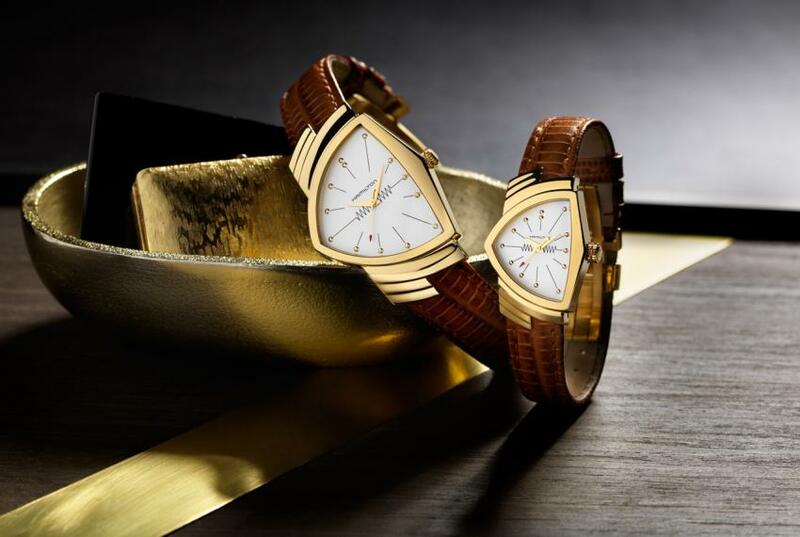 Very similar to the original model 1957, the new Ventura Classic comes in two sizes 24 x 36.5 mm (S) and 32.3 x 50.3 mm (L), both matched with a brown teju-patterned leather strap. Powered by a quartz movement, it will retail for CHF 895. 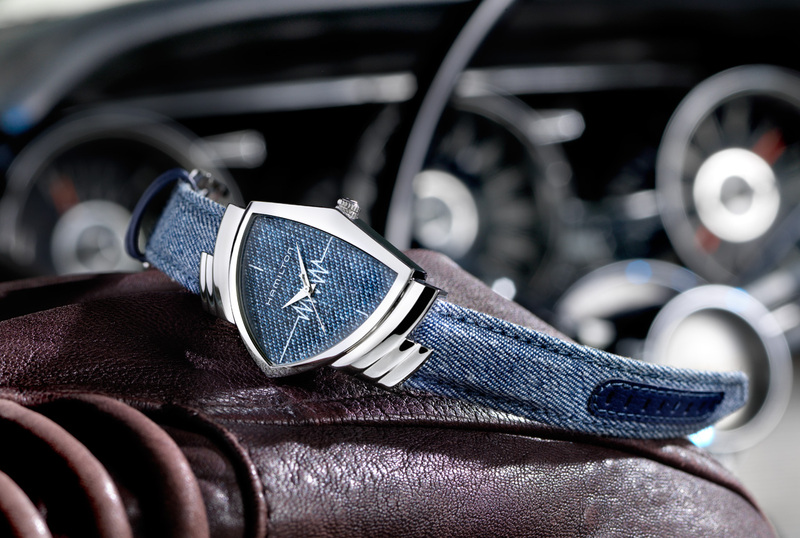 Same size, design and movement as the Ventura Classic, it has a polished stainless steel case and it features a 3D printed dial with jeans pattern. Retail will be CHF 875. The third Ventura unveiled this year is a more modern interpretation of the classic watch, with a larger, 42.5 x 44.6 mm case and a skeletonized dial that makes reference to the microphones used by Elvis. The movement is the skeletonized version of the H-10, offering 80-hours of power reserve. Its price will start at CHF 1,600. 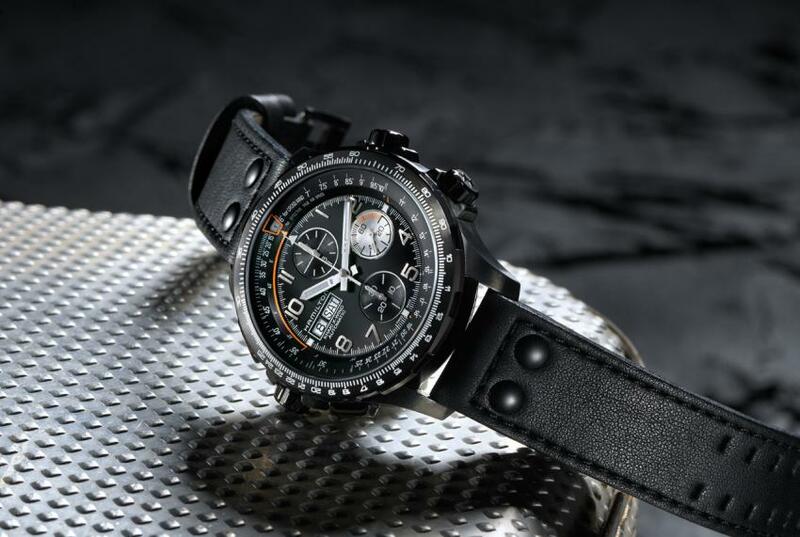 This year Hamilton becomes the official timekeeper of the Red Bull Air Race World Championship. They were involved in air races as one of their brand ambassadors, Nicolas Ivanoff is a famous race pilot and many squadrons are equipped with Hamilton watches. Beyond marketing, this partnership serves Hamilton as a direct way of understanding the needs of pilots. 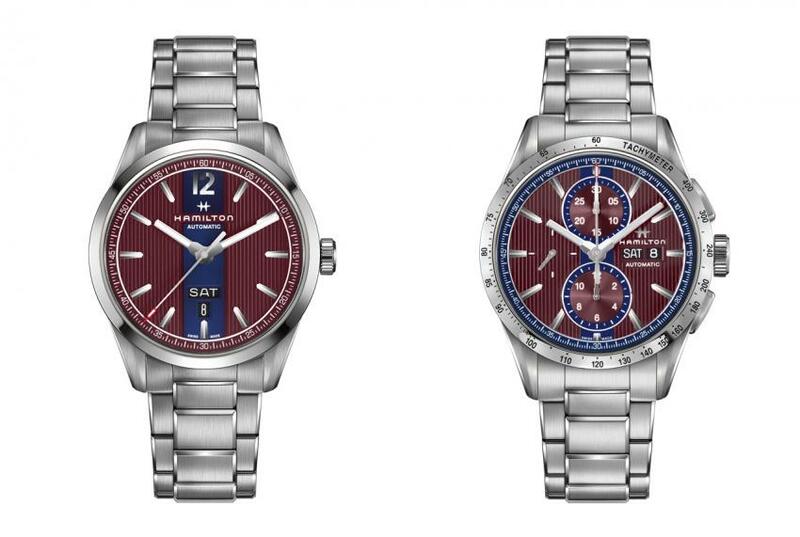 To mark the occasion, Hamilton is releasing the Khaki Air Race collection having two versions: a Team Hamilton model with orange and black dial and an Official Timekeeper model with blue and grey dial with a red second hand honouring Red Bull Air Race colours. Both versions have a stainless steel case in either 38 or 42mm size, with a choice of black leather strap or stainless steel bracelet. Retail price will start at CHF 725. The Broadway collection was first unveiled last year at Baselworld, three models: a quartz day date, an auto day date and a chronograph. Michael wrote a hands-on review of the Chronograph, you can read it here. In 2017, the Broadway family gets new costumes, Hamilton playing with new colour combinations.